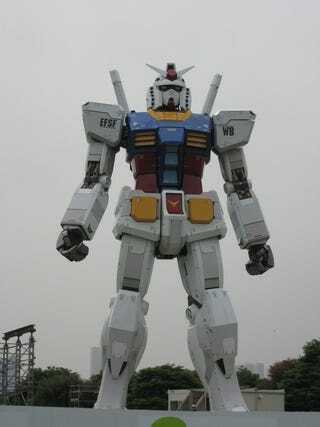 Just when we were getting used to giant Gundam crotch, the rest of the life-sized statue has appeared. That's right, the mecha monument is just about done. Part of the "Mobile Suit Gundam 30th Anniversary Project," the structure in Odaiba's Shiokaze Park will stay up for only two months and be built from fiberglass-reinforced plastic over a steel frame and coated in a layer of awesomeoness. Fifty points on the Gundam statue will emit light, and mist will shoot out of 14 different points on the statue. The 1/1 scale Gundam boasts a moveable head and a continuous stream of oh-man-this-is-so-damn-cool.